Fancy cancels made in the USA during the 19th and 20th centuries were generally carved into cork bottle stoppers. Usually, a cork was dipped in ink and applied to the stamp. However, this often resulted in an opaque sphere almost completely obliterating the stamp and its design. Sometimes it was hard to make out the denomination of the stamp and make sure that the correct amount had been applied to the envelope. So, postmasters began carving designs into the cork, allowing them to cancel the stamp and yet still see it. This brought out the artistic flair of many postmasters and “fancy cancels”—as we call them today—started taking interesting shapes and forms. Crosses or stars were some of the most popular designs. Eventually, when the postal service became standardized, handmade cancels were discontinued in favor of officially produced cancels. 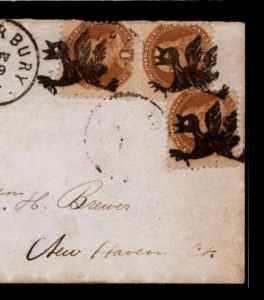 The most famous fancy cancels were made by a postmaster in Waterbury, Connecticut, named John Hill. Mr. Hill worked for the post office from 1865–1890 and in those years produced some of the most beautiful and intricate fancy cancels. They are prized by many collectors today. The most famous of his cork cancellations is the “Running Chicken”, although it is widely believed that the bird is actually a turkey, since the cancellation was put into use around Thanksgiving. According to a New York Times article from 1985, a cover featuring three stamps cancelled with the “Running Chicken” once sold for $264,000 (although I have yet to succeed in verifying this with other sources)! Waterbury Cancellations still get top dollar at auction. More recently, at an auction of the William H. Gross Collection (which contained several examples of Waterbury Cancellations) several specimens sold far above their estimates. For example: a “Rose Blossom” cancellation on a 3¢ USA #U58 ($2 value) sold for $22,000! In addition, a “Baseball, Bats and Bases” on USA stamp #U65 ($20 stamp value) sold for $40,000! Of course, these are some of the rarest and most valuable fancy cancels. Many others exist that are not as expensive and are within reach of the average collector. Check out our own “Rare Stamps section” at Arpin Philately to see if you can spot a fancy cancel that you might like to acquire! Why not send us some Canadian fancy cancels. I have trouble adding meaning to them.